Troopers of an Italian cavalry regiment served dismounted as infantry. 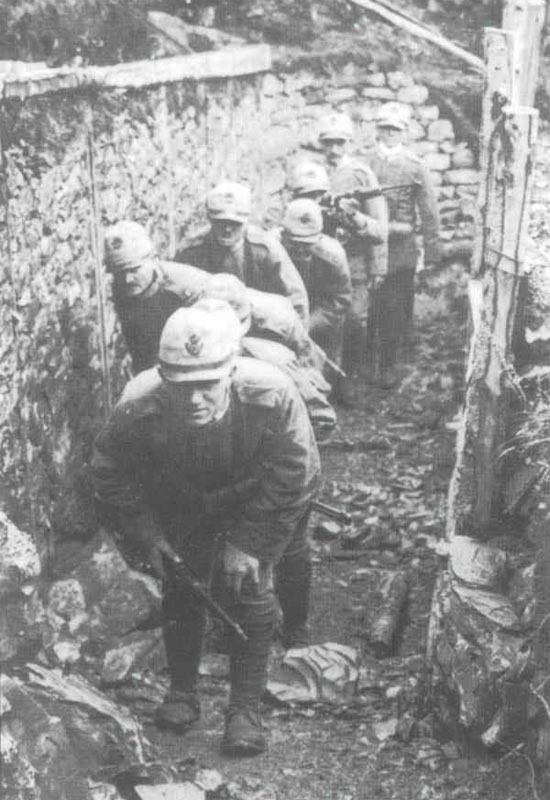 Eighth Battle of the Isonzo (­until October 12): Italian Second and Third Armies’ 225 battalions; 26 dismounted squadrons; 1,305 guns and 883 mortars against Austrian Fifth Army 107 battalions with 538 guns. Bombardment begins. Trentino: Italians regain north slope of Mt Pasubio, more progress in Vallarsa valley (October 11-15 and 17), repel counter-attacks (October 19); 372 PoWs and 8 guns taken. Battle of the Somme: British advance east of Le Sars towards Butte de Warlencourt, 25th Division captures Stuff Redoubt. Greece: ­Venizelos arrives in Salonika, forms provisional government (October 10, Allies recognise October 16); Lambros heads new official government (October 8).